Enjoy watching exciting Jumper action from the best seats in the house – in the Sponsor Tent! 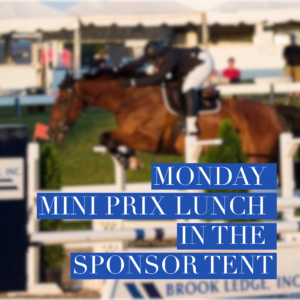 Jumpers are featured all day Monday September 4th – enjoy lunch and watch the LCHSA Mini-Prix from your seat in the Sponsor Tent that overlooks the entire horse show. Catering by Yellow Springs will feature a turkey carving station, chicken salad, green salad, croissants, rolls, cookies & brownies.